Growing up I developed an interest early on in Japanese culture, thanks to my regular watching of Robotech as a child. I was fortunate to attend a high school that had a Japanese language program as one of its available courses and took three years of classes for a great teacher who immigrated from Japan and gave me a solid foundation in the language, but who also introduced us to Japanese culture and to Japanese food, eventually leading to my love of Yakiniku. Over those years we’d make different dishes in class, including Japanese-style curry, rice balls, and miso soup. To this day those dishes are among my favorites and I still make them from time to time. Our teacher would also take us to a local Japanese restaurant, still operating to this day, and which became my first foray into Japanese dining. Our go-to was a combination with beef Teriyaki, chicken katsu, and yakisoba. In the ensuing years I’ve come to learn that the food they served wasn’t always that particularly authentic, but even though it doesn’t taste authentic, it still somehow tastes “right” to me. That limited exposure gave me a love for Japanese food that would mature after high school when I spent two years in Japan and in the process got to discover the great variety of Japanese food that exists beyond the average “sushi and teriyaki” staples of a Japanese restaurant in the West. The first word I learned in Japan was 食べ放題 (tabehoudai), Japanese for all-you-can-eat. It was my first night in Japan after a long journey to get there and my hosts knew well enough that the best thing for a starving 19 year-old would be somewhere that I (and my traveling companions) could get my fill. The most common of the all-you-can-eat places in Japan in Yakiniku, or Japanese BBQ, and that first visit was the start of a life-long love of this style of dining. Yakiniku is eaten at a table with either a built-in or table-top smokeless grill, with the finer restaurants using live coals as a heat source, typical restaurants using gas grills, and some of the simpler establishments using electric heating elements. Meat is prepared by slicing it very thin, typically around 5mm. Meat is generally selected for being well marbled and is sliced against the grain, resulting in a thin slice of meat that cooks fairly quickly when placed on the grill by the diner. When the meat is cooked it is removed from the grill, dipped in a Yakiniku Sauce, and eaten with rice. Japanese BBQ differs from Korean BBQ in that meats are not pre-marinaded, but dipped in sauce after cooking. The vegetable accompaniments can differ as well, with Yakiniku typically coming with peppers, onions, mushrooms and yams. A typical all-you-can-eat Yakiniku menu can be seen here. 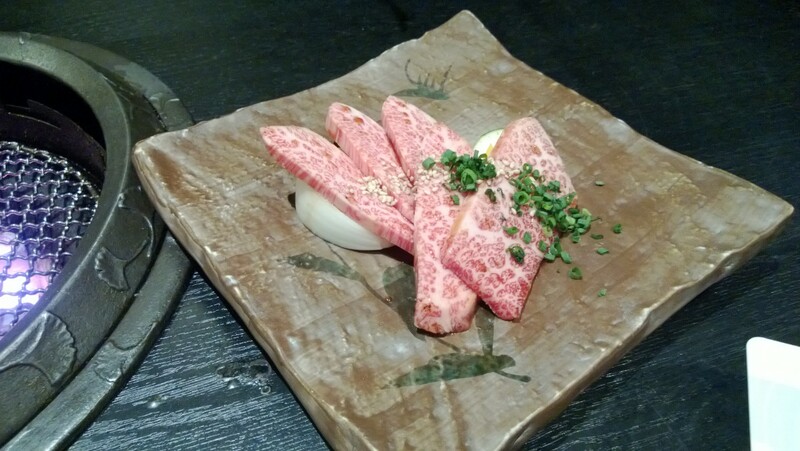 Thanks to how well it is marbled, and how thinly it is sliced, the Yakiniku meat is very tender, especially the higher grades of meat found at a non-all-you-can-eat restaurant. The vegetables are always fresh and the sauces compliment the meats perfectly. Best of all, Yakiniku makes for a great dinner out with friends, because of the active aspects of the meal: there’s always something to cook and everyone gets involved. Because the whole meal isn’t ready to eat when it hits the table, people have plenty of pauses in the meal to chat, often about the meal itself. When I lived in Japan I was young and on a budget, but going to an all-you-can-eat yakiniku restaurant was a weekly tradition where we got our protein for the week. On special occasions friends would take us out for yakiniku at a non-AYCE place, and it was a rare treat to get the particularly marbled meats that would be served. After I came home I was generally limited to making yakiniku at home, as yakiniku restaurants are not common in the west. Once I started traveling for business in North America I could find some good restaurants to get my fix in areas like LA, New York, and San Francisco, and introduced a number of my coworkers to the joys of yakiniku over the years, but there was always something lacking; either the flavours or cuts would be modified to western tastes, or the restaurants were run by staff that understood the principles of yakiniku, but not being from Japan they would lose some element of the experience along the way. Finally I got back to Japan for work, going around the world to train and manage an international team of Sales Engineers, and I would find myself in Tokyo every few months staying at the Marriott Courtyard Ginza, a great hotel that was well located for food and transit. The first night back in Japan I knew exactly what I wanted to do, and immediately sought out the nearest yakiniku restaurant I could find, which fortunately for me turned out to be less than a block’s walk away, and right behind the hotel. It was there that I took this photo, that first night in Tokyo, re-introduced to the yakiniku I’d been looking for after all those years. Heijouen became a regular stop almost every night I was in Tokyo, and I went so many times between 2013 and 2014 that the waitress actually started to recognize me. It was everything I remembered loving about Japanese BBQ, with amazing cuts of meat, fresh vegetables, a real coal-fired in-table grill, and excellent service (this location even had an English-language menu and a waitress who could speak passable English). On each visit I had a system: because I had a per-diem I made a point of finding a low-cost breakfast and lunch, using up maybe 20% of my total allowance. The remainder I’d spend each night of my stay at Heijouen eating my favorite yakiniku dishes, usually some short-rib, pork jowel, onion and mushrooms. Short-rib was available in different grades of marbling, but even the base grade was good there. I’d usually get one order of the base grade, and one of the good Kobe beef (the first to fill you, the second to savor). It’s been a few years since I’ve been to Tokyo, and I hope to get there again someday. If I do, I know where I’ll be going first!